Along came Crestron’s competitors – other home automation companies that realistically couldn’t come close to achieving all of what Crestron was capable of. The reason these companies succeeded? The price was right. The other home automation companies realized that homeowners were perfectly fine getting 50 to 80 percent of what was possible with a fully customized system – as long as it was 50 percent of the normal price tag. While it’s nice to have the ability to make Crestron do whatever you want, whenever you want, that comes at a cost. The extensive programming required for Crestron systems was expensive, time-consuming, and it often resulted in half-finished jobs. Integrators didn’t understand what they were getting into, how to manage software, how to manage programmers, and even how to manage the files themselves! Ultimately, it was the customer that suffered. The system wouldn’t work properly, didn’t have a nice UI, and if the homeowner wanted to bring in another company to do it right, the new integrator wouldn’t want to touch the software – they’d tell the customer they’d have to burn it down and start from scratch. It put a sour taste in the mouth of the whole industry and the end user. Crestron was no longer the golden child of home automation. Obviously, something had to change. Crestron tried to achieve that with Pyng and Smart Graphics. Smart Graphics forced the integrator to do a better job with the UI experience. Where you used to have thousands of options for what a button or icon set would look like, you now had a handful and the handful all looked good. Of course, the other home automation companies had standardized UIs from the beginning, but the downside was that they offered no ability for integrators to control and customize. With these other systems, when a homeowner requests anything outside the standard offerings, the integrator has to say no – unlike with Crestron, where the integrator always has the ability to say yes. When Pyng came along, it allowed the dealer to get in and out of a system very quickly, but it had the same problem other home automation brands face: You couldn’t change how it works or looks, and you had to choose from a pre-defined database of devices. You do have some ability to schedule and customize but not entirely. Studio expanded those abilities, allowing dealers some freedom to customize, add devices not in the database, and so forth, which helped a bit. But it didn’t solve the problem. It had a long way to go. 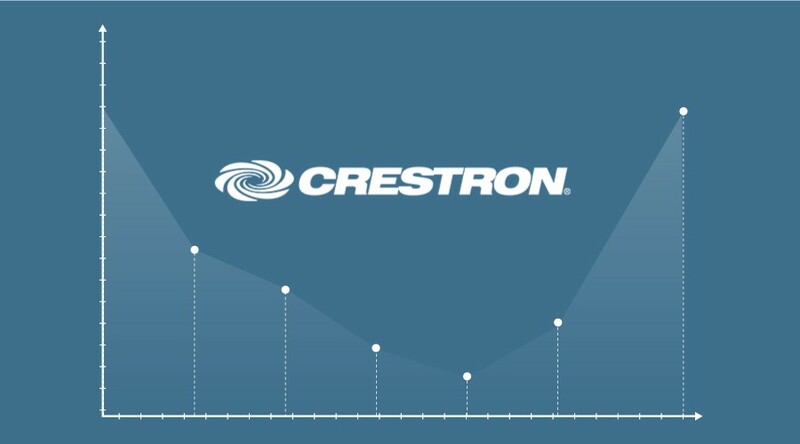 The drop in the adoption of Crestron systems was part of a larger issue in the industry. Integrators became very fragmented in their approach to projects. They have a client who says “I want a TV here, audio here, this and that.” Then the integrator has to look at the fact that they sell four different home automation systems, and even within a system like Crestron, they’ve got Pyng, D3 Pro, SIMPL Windows, and Studio – and every single one of them has a level of complexity. Integrators are fragmented in their approach because they’re basing their decision of what to do NOT on their business model, but on the system itself. Fragmented business models have led to technicians that are jack of all trades, masters of none, and they still don’t have the ability to easily customize systems to meet customer demands. It’s not efficient, and thus it’s not profitable. Integrators need something that allows them to crank systems out over and over again by doing simple configuration without being boxed into a tiny feature set. If you can rely on one method and one home automation manufacturer while also ensuring you never get stuck, you’ll ultimately be more successful and more profitable. Only Crestron keeps you from getting locked into programming systems in one very-specific way. And only ADAPT gives you the ability to program and customize Crestron lightning-fast. ADAPT is the Swiss army knife of Crestron programming software. Setting up systems takes hours instead of days. Modifying a UI can be a five-minute process. When your client comes to you and says “My system is broken because X,” you check the box, load the configuration file, and you’re done in 30 seconds. You get the power and reliability of Crestron with none of the downsides. Want to see ADAPT in action? Schedule a personalized demo with the ADAPT team here.